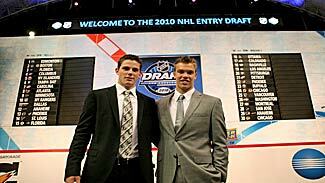 LOS ANGELES -- Even though he knew the moment was at hand, Taylor Hall still had no idea he was about to become the first pick of the 2010 Entry Draft. "Before the thing TSN told me they were going to make the first pick at 4:30 (Pacific time), so I wasn't expecting it," Hall told NHL.com minutes after pulling on an Oilers jersey for the first time at the Staples Center . "At 4:15 they went up to the podium to pick, so it was good I wasn't ready for it." Hall, the dynamic left wing from the Windsor Spitfires, was the Oilers' pick, ahead of Plymouth Whalers' center Tyler Seguin. The two have been tied together for much of the season as the consensus best two players available in the draft. Seguin and Hall were ranked Nos. 1 and 2, respectively, by NHL Central Scouting, with the sole difference in the scouts' eyes being their position. "The full season of body of work that said he (Seguin) is going to be a great player in the National Hockey League," Central Scouting Director E.J. McGuire told NHL.com. "So is Taylor Hall. In our mind, other than the position, they are equal." But the Oilers had to make a decision. So what pushed the needle to Hall? "We felt like with Taylor, if you look at his resume of playing with the best team and being the best player, back-to-back Memorial Cup MVP's, prominent in the World Junior tournament, prominent on his own team for his entire junior career," GM Steve Tambellini told TSN. "I haven't met a more competitive player than this young man." Hall's resume is pretty strong -- 6 goals and 12 points in helping Canada win a silver medal at the World Junior Championship, 106 points and a share of the OHL scoring title, and the first-ever two-time Memorial Cup MVP. "I think we had a lot of discussion about the centerman," Oilers president Kevin Lowe said. "We're not trying to build a Stanley Cup (champion) overnight. If the guys we have don't evolve into that No. 1 centerman, we hope we will be able to draft one or acquire one in the coming years." Seguin said he wasn't sure what was going to happen when Tambellini went to the podium, but he was hopeful. "It just got really hot and my cheeks got rosy," Seguin said. "Nothing really was going through my head, just curious to see who they were going to pick." That left Seguin to the Boston Bruins, who after a bit of a wait made him the No. 2 pick. "I was sitting there and wondering if Boston was going to make a trade," Seguin told NHL.com not long after pulling on his black Bruins jersey. "I was a little confused, but it was worth it. It's a great feeling. I can sit back and relax now." Chiarelli said he never got an offer good enough for him to move the pick. "Not after I spoke (to the media) earlier today," said Chiarelli. "To the point where we picked the pick, there was nothing." Chiarelli may have been picking second, but he certainly doesn't think he got the second-best player. "He's a terrific player, he's got a terrific skill set," said Boston GM Peter Chiarelli. "He's still growing. His improvement has been tremendous over one year to the next to the next. Very smart, terrific hockey sense, vision, good stick, very underrated wrist shot. He's got the whole package." The debate on Tyler vs. Taylor is over -- for now. "They're not going to surface as much, but I'm sure the debate will still go on for our whole careers," Hall said.